Quinoa (keen-wah) is something that I’ve heard a lot about, but have never tried … despite having some in the pantry for months. It’s an interesting, ancient grain that has a rather unique texture, and it’s really good for you! The texture is kind of crunchy and soft at the same time. At first I wasn’t sure what to expect, but I’m pleasantly surprised. The flavor of quinoa is mild and nutty, which is easily adaptable. This week’s Meatless Monday quinoa pilaf is filling and works well as a main course, but it would also make a wonderful side to a nice roasted chicken. After researching about quinoa and it’s flavor, I thought that mushrooms would be a nice compliment to it’s flavor. I have to say that after eating this quinoa mushroom pilaf, I’m definitely a big fan of quinoa and can’t wait to try more recipes! If you’re on the hunt for a dish that is relatively simple to make, and yields scrumptious results then I highly recommend this one! Heat olive oil in a medium pan over medium heat. Add mushrooms and sauté for 5 minutes or until beginning to soften. Add garlic and cook until fragrant, about a minute. Add quinoa, stirring to toast for a minute. It should become rather fragrant. Add in salt and pepper to taste. Add water, dried thyme and bay leaf. Bring to a boil, cover and reduce heat and simmer for 9-11 minutes. Remove from heat, fluff with a fork and stir in cheese. 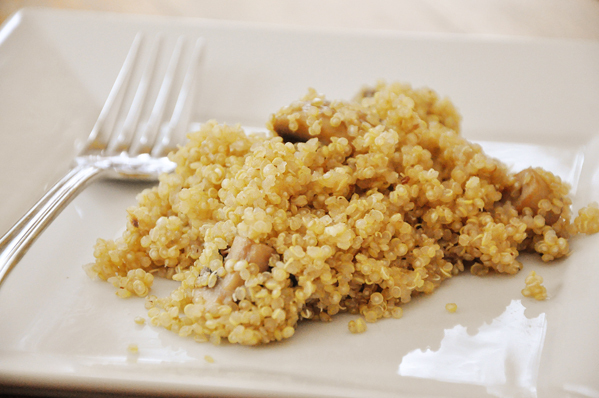 Let me know if you give this quinoa mushroom pilaf a try in the comments below.